“Article Publication” is a WordPress Plugin Specially Designed for Creating Publication House. Academic Article(aka Journal) Publishers can Accept Articles using this plugin by Simply Submitting it from the Website Submission form. Publisher can Manage & Publish Articles using the Plugin. Plugin can be used by any Person/ Group of Persons who want to Start their Academic Publication house. – Any Author or Group of Author(s) can submit their Article(s). 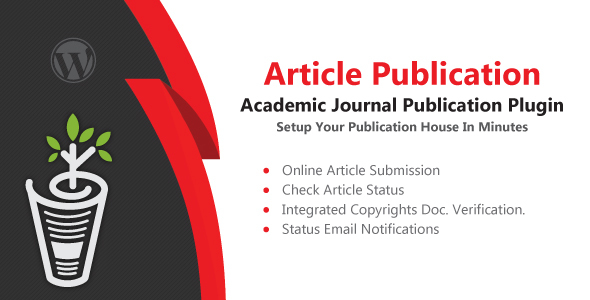 – Author(s) can check status of their Submitted Article(s). – Admin can Manage Submitted Copyrights doc’s of the Articles. – Author(s) will get Emails on Status Update of their Article(s). – Use this widget in any Page, Post or Sidebar to display Information of Current Article Issue Proceedings. – Format Emails for all the Statuses, Reminder & Payment Confimations using Visual Editor. – Manage & Verify all the Submitted Copyrights documents & Payment Receipts of recpective Articles within the System. – Download Volume, Issue wise Reports for any Statuses(Underreview, Accepted, Rejected, Published).